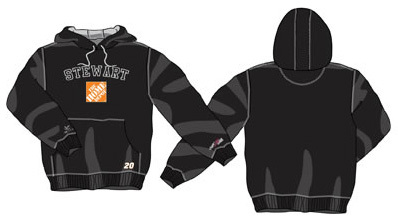 Tony Stewart #20 Home Depot Hooded Sweatshirt, by Chase Authentics. Officially licensed Tony Stewart black hooded sweatshirt featuring the driver's name displayed on the chest, 80% cotton 20% polyester. This high quality hooded fleece has a combination of embroidery and diecut felt appliqué. Reduced from $64.99.